Whittlesey Athletic dangerman Matt Heron (white). The biggest issue for Langtoft United manager Ryan Hunnings ahead of tonight’s (May 19) PFA Senior Cup Final against Whittlesey Athletic at the ABAX Stadium is how to clip the wings of free-scoring Matt Heron. Langoft, who finished the Peterborough Premier Division season 38 points and seven places behind Whittlesey, have twice suffered at the hands of Heron in the 2015-16 campaign. The powerfully-built striker scored three times in a 5-1 Premier Division win at Langtoft and all four goals in a 4-0 win in the reverse fixture. “We were well in the game on both occasions,” Hunnings, who will be without his own suspended top scorer Joe Dobson tonight, stated. “We were 1-0 up at half-time in the first game and just 1-0 down in the second match with 20 minutes to go, but Matt just tore us apart late in the day both times. “We will have to come up with a plan to stop him, while also coming up with a plan to play without Joe who has scored most of our goals and is an integral part in how we play. He’s our big man up top. “But we are going into the game excited and confident as we have nothing to lose. “We lost a manager after one pre-season game so I stepped up from the reserves with a brief to keep us out of relegation trouble. “We’ve over-achieved in the league and reaching the PFA Cup Final, and having the chance to play at the Posh ground, both for the first time in the club’s history, are wonderful bonuses. Heron has 31 Premier Division goals, but drew a blank in the final match of the league season last Saturday (May 14), a 3-0 success at Uppingham. Matt Harrold, Sam Donohoe and an own goal enabled Whittlesey to finish the season eight points behind champions Moulton Harrox. And Langtoft should not just be concerned about a star striker tonight. Whittlesey finished the league campaign with six consecutive clean sheets. Andy Lodge’s men kept a remarkable 23 clean sheets, and conceded just 17 goals, in 34 Premier Division matches. 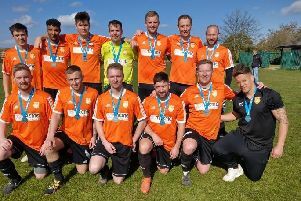 It’s no wonder they are got favourites to retain a cup they won in thrilling fashion on penalties against Netherton United when playing under the Coates Athletic banner last season. “We see this as our cup and we want to keep hold of it,” manager Lodge stated. “Winning promotion to the United Counties League was our main priority this season which we’ve achieved, but retaining the cup was high on that list also.